There are some special vehicles in the automotive history that influence their fans. This means still increasing interest in their heritage and of course in their ownership. And this is more intensive, when one of these fans is an owner of not small tuning company that hasn’t any showcar yet. So this is the time for a really luxurious project. We’d like to introduce you an American tuning company called Bulletproof Automotive and their showcar made of Honda S2000. The Honda S2000 is a popular stylish roadster made by Japan designers that was created on the occasion of the Honda’s 50th anniversary. Meanwhile it’s also a successful follower of previous sporting models as S500, S600 and S800. It’s a real fun car after some time – an engine in front, RWD so it provides exciting ride all the time. And don’t forget it’s a convertible. This vehicle has a few important advantages compared to other cars, not only tuning ones. These advantages particularly involve its small dimensions (with only 2 seats), only 1200kgs of weight, super temporal design and of course amazing handling. And it has an astonishing aggregate inside. Honda installed a 2.0 liter 4-cylinder aggregate with DOHC-VTEC direct injection. It can produce 243hp (179kW) at surprising 8300rpm. It’s very impressive value also in these days, when there are similar engines with similar power, but turbocharged or supercharged. But this wasn’t the S2000’s only engine; there are still a few modifications for different markets and needs. Bulletproof Automotive isn’t much known tuning company among Europeans, but their results are one of the greatest on the scene. 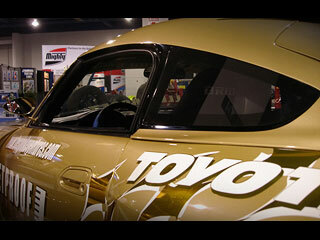 This American company provides import and distribution of high performance tuning parts from Japan. And it’s well known that Japanese are crazy about tuning. So Bulletproof Automotive has decided to build their own showcar for presentation. The car has a very long list of modifications. Let’s get started from the exterior with a really wide bodykit. It’s interesting that it’s made of more bodykits from various companies as Tracy Sports, Top Secret and Powerhouse Amuse. Creativity has no borders and this car proves it. The bodykit is an incarnation of bold ideas and brain waves of designers assigned to build a fascinating showcar. The front part of the vehicle is characterized with the extending massive bumper with one central opening providing cool air to the engine’s cooler. On the sides we can find two pairs of smaller spoilers correcting this air-flow. The bumpers have oval lines, same as the rest of the bodykit and it’s fluently connected to the extended fenders. These are parts of Japanese wide bodykit same as the distinctive side sills. Side of the car is something not seen very frequently. The space behind the front wheels is 100% used with many openings as a pair of vertical elongated right behind the wheels and six branchiform ones behind. All openings are used to off take hot air from the brakes. They also have fancy side sills that are continuously connected to extended rear fenders. But don’t forget about external mirrors inspired by JGTC NSX with a decent carbon line. 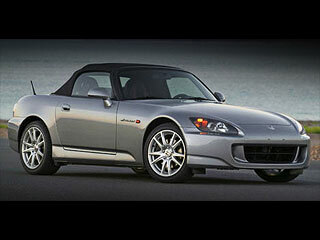 Everybody knows that the Honda S2000 is a roadster with a canvas roof in the stock version. But it’s noticeable at the first sight, that this modified Honda is a little bit different. Ann that’s the element that Bulletproof Automotive designers are proud of. The custom hard top was specially designed for this car and meets all necessary requirements of aerodynamics. It’s attached to the stock roof and visually stretches the car. There’s a decent wing and third brake light on its end. Additionally windows are created by Bulletproof same as the front window is. Yes, the rear part makes many of us having willies. It has a distinctive extending of rear bumper with wild design. Openings for hot air off-take from the rear brakes are situated in the extended fenders nearby rear lights. The rear bumper is heavily modified and it’s very different from the stock one. The bumper is wider thanks to a pair of side wings and massive carbon diffuser. This one hides a pair of Tracy Sports’s 70mm wide titanium exhaust tips. The car is trimmed with the finest stuff from Japan tuning scene – gold paintworks by Top Secret and ornaments by Japanese graphic designer Manabu Mana-P Suzuki. When you’re building a showcar, you need to think about all aspects and parts of the car, especially about what’s under the hood. It’s necessary that also the engine needs to be well maintained, same as the car‘s exterior. So Bulletproof Automotive did some huge changes in this way. The stock F20C engine is now controlled by AEM control unit and Vortech compressor. The engine has new Tracy Sports‘s buffed lead-ins, then connected sporting exhaust system with a sporting catalyzer also made by Tracy Sports. Shifting is now provided with a carbon clutch by ORC and short shifter. The rear wheels drive is secured by the Bulletproof Automotive’s carbon shaft. This list of modifications is long and no doubt that there’ll be a nice performance boost. But unfortunately we don’t know any numbers yet. So let’s start – now we can stop thanks to more powerful disc brakes by Js Racing with 6-piston brake calipers. And the there are new shock-absorbers, springs, spindles, arms, joints etc. This suspension is only of its kind, because it’s a sporting suspension with immediate electronically change of ground clearance. 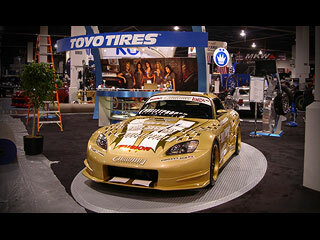 The Bulletproof Automotive Honda S2000 has two types of wheel set – street and track. Our pictures show the track set including 12-spoke black rims RAYS Japan which have 18x10.5 dimensions on both axles. These beautiful rims wear Toyo R1R 265/35/18 tires. The interior of the beast combines comfort and effectivity. Elegant, but important changes don’t distract the harmony of the interior, but increasing comfort and safety. Stock seats were replaced with sporting carbon models by Bride together with Top Secret’s sporting steering-wheel and titanium shift stick by ARC. How do you like the modification of Honda S2000 GT Bulletproof?